HateLab will focus on using data science methods, including ethical forms of AI, to generate insights into the problem of hate both offline and online. Researchers at Cardiff University have been awarded grants totalling over £1 million for the new HateLab, tasked with assessing the impact of national events on levels of online hate speech and offline hate crime. It is hoped that any spikes seen on a newly-developed Online Hate Speech Dashboard will allow police and the government to pre-empt outbreaks of hate crimes on the streets. Experts now recognise that Brexit has drawn sharp divisions in society, and the seemingly impossible promises made by leave backing MPs have created a great sense of disillusionment in millions of citizens. “Whatever the outcome of Brexit, be it a second referendum, a soft-Brexit or a no-Brexit, there is concern that events will motivate more online hate speech and hate crime on the streets. As we saw following the 2016 vote, and to a more extreme extent following the 2017 terror attacks, surges in online hate speech coincided with significant increases in hate crimes offline. Our research and technology will help organisations to quickly recognise warning signals in real-time so they can take necessary action to support victims” said Professor Matthew Williams. Experts believe the terror attacks between March and June last year were the main contributor to the 17% increase in hate crime in the UK in 2017/18. In total, 94,098 incidents were recorded by the police, the highest number since records began. Authorities are preparing for a further increase as the UK’s departure from the EU gets closer. The HateLab, part of the Social Data Science Lab based between the University’s School of Social Sciences and School of Computer Science and Informatics, has been established with funding from the Economic and Social Research Council (ESRC) and the US Department of Justice. 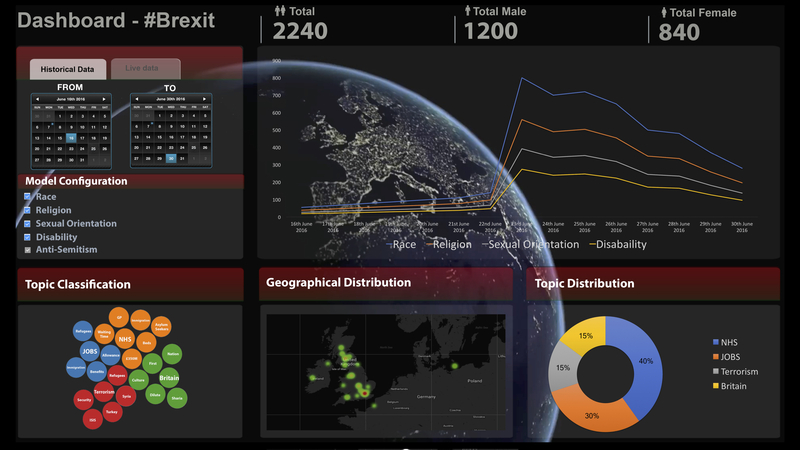 The Online Hate Speech Dashboard is being developed in partnership with the National Police Chiefs’ Council’s (NPCC) National Online Hate Crime Hub. The Hub was announced by the Home Secretary in 2016 after the Brexit vote, in response to the rapid increase in online hate speech targeting people because of their personal characteristics. It is tasked with improving the criminal justice experience for victims of online abuse. Professor Pete Burnap, computational lead on the projects, said: “HateLab will provide the new Hub with an essential service to better support victims. Access to real-time public communications from social media platforms will allow Hub staff to monitor hate speech at an aggregate level using cutting-edge ethical artificial intelligence created in our Lab. The Lab is also working in close partnership with all four police forces in Wales, Greater Manchester Police, Welsh Government, and several leading hate crime charities including Galop and Community Security Trust. The team has already undertaken several pioneering studies on the spread of hate speech on social media, most notably around the murder of fusilier Lee Rigby in Woolwich in 2013. The project’s latest grant, awarded under the ESRC Governance After Brexit programme, will enable HateLab to address the key challenge of determining if events of national interest led to genuine rises in hate crime perpetration, potentially rebutting the claim that the police recorded spikes were merely a result of victims’ increased willingness to report. Working with Rand Europe and the NPCC, the project will link multiple offline and online datasets, providing the most complete picture of hate crime to date. HateLab research will be showcased at an invite only All-Party Parliamentary Group meeting at Westminster in early 2019 to an audience of MPs, Lords, senior civil servants and policymakers.